Karama is delighted to support the launch of a report looking at the problems that have stalled progress in Libya’s democratic transition, and details how progress can be made. Since the 2011 revolution, Libya has struggled to make progress towards democracy, with frequent false starts, violence, and political and geographical division. Throughout this strife, Libyan women have shown an alternative, peaceful way for the country. It was women lawyers like our late colleague Salwa Bugaighis who were the first to demonstrate outside Benghazi’s courthouse, sparking the democratic protests that spread across the country. 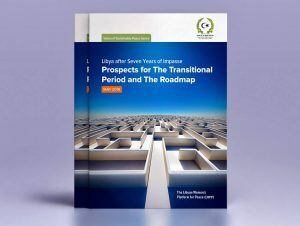 Now, seven years later, it is the organisation that Salwa co-founded that publishes a unique report, identifying the history of the obstacles to progress. As well as providing essential context on the country’s political and constitutional history, its findings underline the need to ensure that future entitlements, including elections and referendums, do not exacerbate the division and violence, to maximize the added value they are intended to produce, as well as the need to unify state institutions before proceeding with such entitlements. The report suggests that has been hamstrung by its limited political mandate. The report states that the UN mission in Libya should reformulate its strategy, and the Security Council and the United Nations should adjust the Mission’s mandate and modify its structure. The Libyan Women’s Platform for Peace, founded on 7th October 2011, is a movement of women and youth leaders aimed at freedom, equality, social justice, citizenship rights and building a sustainable peace.